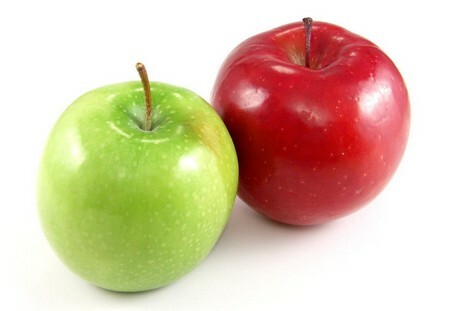 Health benefits of apples are widely known as they help lower cholesterol, regulate blood sugar, prevent gallstones, strengthen immunity, aid in weight loss, and protect against certain types of cancers. However, did you know that this crunchy and nutritious fruit can also work as an excellent natural skin cleanser? Apples are packed with vitamin B complex, vitamin C, beta carotene, iron, calcium, potassium, phosphorus, magnesium, and phyto-nutrients. Apart from delicious eating apples daily, you can make use of this fruit by cooking it in boiling water for 15-20 minutes and then, including it in homemade facial masks to beautify your skin. Besides, you may use applesauce, or simply grated apple in your facial mask. While preparing skin care recipes with apples, prefer to use varieties like Red Delicious and Granny Smith as they are rich in collagen and elastin that help maintain younger looking skin. Moreover, it is believed that regular consumption of apples facilitates hair growth because they contain a compound called Procyanidin B-2. • Cut an apple into small pieces and boil them (remove the seeds but do not peel) in half a cup of water. Next, puree the apple, add an equal amount of wheat germ in it, and prepare a smooth paste. Apply this exfoliating face mask on your face and neck and wash it off after 10 minutes. • Prepare a natural skin cleanser by combining two tablespoons of milk (preferably whole milk), one tablespoon of apple juice, and one teaspoon of organic honey. Apply it on your face and neck with the help of a cotton ball. Rinse with lukewarm water after a few minutes. All these natural ingredients will make your skin soft and bright. • Mix two tablespoons of rolled oats, one tablespoon of honey, and one and a half teaspoon of cornmeal to form a paste. Then, blend this mixture along with half an apple (chopped) in a blender or food processor. Scrub this paste on your face gently in circular motion and rinse it off with lukewarm water to get clear skin. It also tones up your skin naturally. • Those who have oily skin can apply a combination of one tablespoon of apple juice and five to six drops of lime juice to reduce greasiness. Watch this video showing how to prepare an apple night cream (with apple, olive oil, and rose water) for sensitive skin. • You can make an under eye cream at home by blending a small raw white potato (peeled and chopped) and two tablespoons of unsweetened applesauce to form a creamy paste. Take a washcloth, dip it in warm water, and wring it. When you apply the cream cover your face with this warm washcloth for ten minutes. • Simply applying applesauce on your skin on your skin for about 20 minutes can help reduce wrinkles and open clogged skin pores. You can add one teaspoon each of lemon juice and dried herbs such as sage or rosemary, too. • Mix two tablespoons of applesauce, one tablespoon of ground oats, two teaspoons of lemon juice and a teaspoon of honey. You may add a teaspoon of activated charcoal as well. Apply this facial mask for 15-20 minutes to get clear skin. • You can tone and tighten your skin by using the following homemade skin care recipe. For this, you need to cut an apple into pieces, remove the seeds, and boil the fruit in half a cup of warm (use warm water so that it boils soon). When it cools, strain the mixture through a fine sieve or colander and add a quarter cup of witch hazel in the liquid. Soak a cotton ball in the solution and apply it on your face. It shall also give a healthy glow to tired skin. • To ease sunburn and prevent blistering, grate an apple (preferably Braeburn), add a teaspoon of glycerin in it and apply this paste on skin for about 15 minutes. Finally, rinse it off with cold water.